28519 Herrera Street, Valencia, CA, 91354 new listing as of 02/20/2014 in the Valencia West Creek neighborhood, Esperto town home tract of Valencia CA in the city of Santa Clarita CA. 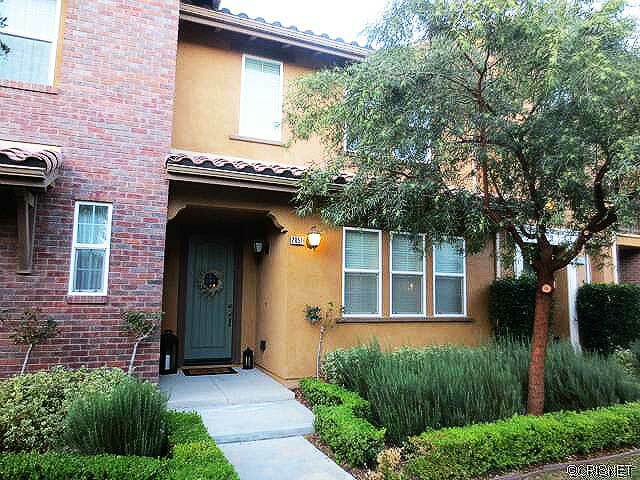 This great 3 bedroom 2 bathroom town home has 1630 square fee close to Tesoro Village shopping and the Valencia paseo system. See more below. Gorgeous Valencia townhome featuring 3 Bedrooms, 2 ½ Bathrooms & open floor plan. Large living room/dining room combo with white wood-type blinds, carpet & ceiling fan.Upgraded kitchen with granite counter tops, tile flooring, black GE Profile appliances including a 5 burner stove & recessed lighting.Downstairs half bath with pedestal sink & tile flooring.Upstairs features a large master suite with ceiling fan, white wood-type blinds & a large walk-in closet.Master bath with double sinks, marble counters, a large tub & separate shower.2nd bedroom with mirrored closet doors, ceiling fan & sliding door leading to balcony.3rd bedroom with mirrored closet doors, ceiling fan & a door to the shared balcony.3rd bathroom has marble counters, tile flooring & a tub/shower combo.Upstairs laundry room with tile flooring & cabinets.Tall 9 foot ceilings throughout most of home. 2 car attached garage. Amazing HOA amenities including a clubhouse, an extra-large swimming pool & spa with bbq area, a 17 acre park including a play area for kids, basketball court, picnic areas, stretching area & walking trails.Walking distance to West Creek Academy Elementary School & Rio Norte Junior High School. Fantastic area, turnkey home, regular sale..what more could you ask for! ?